You can use the panoramas on their own (in Blender and any 3d software) or with the help of the SceneSkies addon (free) which is a HDRI manager for Blender. The collections contain the same scenes at different times of the day, including night time for some, and different weather conditions. So you can choose the lighting conditions best suited to your scene and desired mood. It is also possible to test how your materials and models look under different lighting conditions: direct sun light, more diffuse lighting in a cloudy day, or with a dim moon light. Never seen before and totally unique to SceneSkies: change the color and brightness intensity of the sun, the atmosphere, the clouds, and the ground surface, all independently of each other. This unique feature of SceneSkies' panoramas is perfect when you need to have lighter or darker clouds, have a warmer or colder sun color, more or less contrasted shadows on the ground and mountains, have a thicker or thinner atmosphere, have a different shade of blue for the sky, change the color of the mountains, and more (colored clouds, no atmosphere, etc...) By tweaking the color and intensity of those 4 elements, you can have radically different visual results from the same panorama, giving you control over the look you're after, or the possibility to experiment in subtle or extreme ways. Best of all: your changes do impact the lighting of your scene. 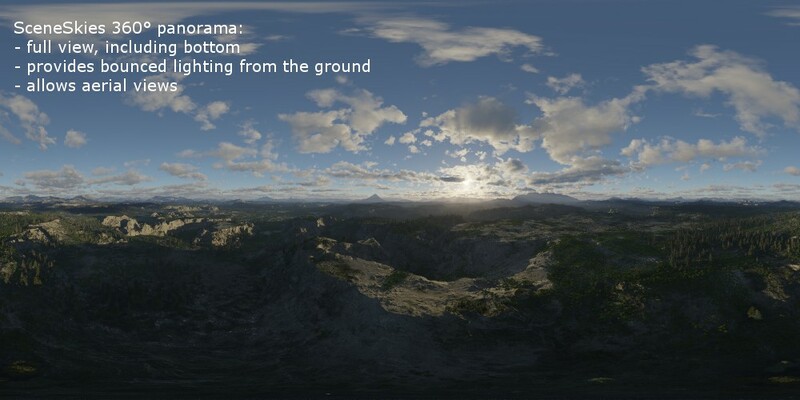 SceneSkies' panoramas have been digitally rendered. As such they don't have any of the issues of traditional photography: never out of focus, no lens distortion, no lens flares and light bleeding, no dirt on the lens, no hardware defect issues whatsoever. 16k really means native 16k, not upsampled or 8k-equivalent blurry. These are not just skydomes or hemispheres (top half with black bottom), but full spheres, including the bottom. Why do other HDRIs so often have a black bottom? Simply because they don't have anything to show except a boring grassy or rocky ground, about 1 or 2 meters below the camera. In SceneSkies' HDRIs on the other hand, you have the full view, with terrain details even below the camera. 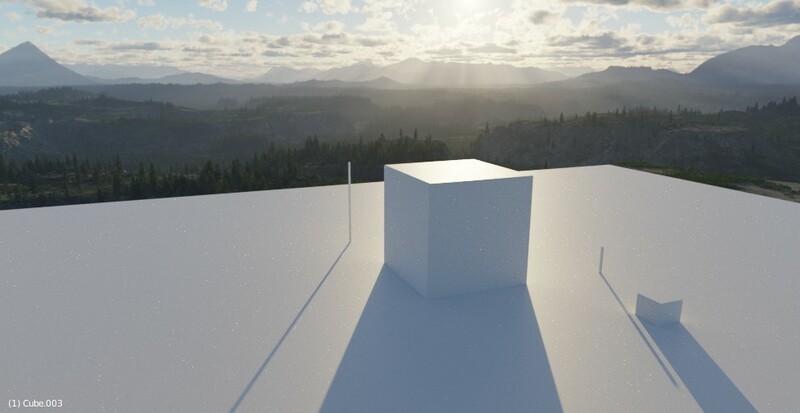 This is important for realistic lighting because the lighting not only comes from the sun and the sky, but also bounced light from the ground. This has the added benefit of making aerial shots possible. Most HDRIs fall short when it comes to surrounding a large 3d scene such as a city, because they are taken about 1 meter off the ground. Consequently they have annoying close objects in the foreground (trees...), and the ground is so close it looks out of place. 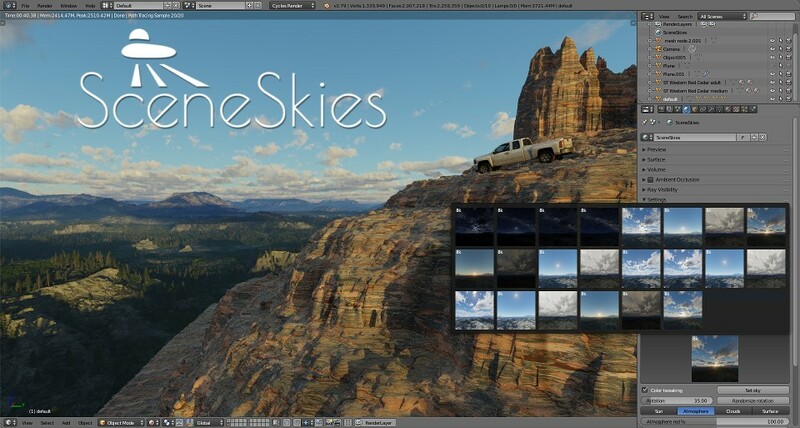 SceneSkies' HDRIs are taken from some altitude (tens or hundreds of meters), giving you only distant mountains and clouds in the horizon, no close objects. Hard drive space isn't free. Even in our age of terabytes, we can't afford hundreds of megabytes per HDRI. 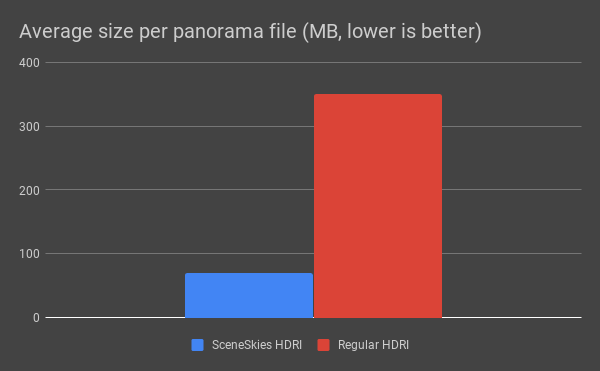 SceneSkies uses state-of-the-art EXR compression methods to achieve very low file sizes with no visible compression artifacts: a 16k HDRI weighs 70MB on average versus more than 300 for most other HDRIs. A 16k panorama takes only 1GB of RAM, vs 2GB for most other HDRIs. This is because most of them use 32-bit colors vs 16-bit for SceneSkies. This is a technical choice, and while 32-bit sounds superior to 16-bit because we can encode colors with even higher precision, in practice such high precision is unneeded. First we'd need special cameras to capture such subtle differences, then proper display devices and tone-mapping algorithms that can take advantage of the added precision, and even with all the proper gear our eye couldn't even see any difference in the end. So instead of wasting precious hardware resources for almost zero return, it's best to stick with 99% of the benefits for only half of the disk, RAM and CPU usage. If you're rendering on your GPU this is even more important, as GPUs typically have less video RAM than standard RAM. SceneSkies' panoramas are fast to load, even at 16k. Thanks to using the proper file format: modern EXR, efficient compression, 16-bit instead of overkill 32-bit, no unused alpha channel. On an i7 7700k and a SSD a panorama of SceneSkies takes 1s to load then 1s to display, versus 17s to open then 5.5s to display for a regular 32bit .hdr file. That's a 1100% gain in speed. This wasted time quickly adds up when you often do test renders while you're working. The number one quality of an HDRI is how wide its brightness range is, and how closely it captures the high differences of luminosity seen in reality. SceneSkies' uses the full precision-capacity of 16-bit float values, with the sun being thousand times brighter than the shadows. Nothing is clipped, not even the sun itself. And nothing is totally dark either, not even at night time. Play with the exposure in your software, and details appear where you thought it was just black or white. SceneSkies' HDRIs give sharp shadows in clear weather conditions, thanks to the above-listed characteristics. This is a must-have for any high-quality HDR panorama. If you have any particular question on SceneSkies, do not hesitate to ask me directly. The pack contains several collections, and each can be downloaded as a zip file at different resolutions depending on the version you bought: 8k, 12k, 16k. The panoramas are standard HDR equirectangular images. They are each in their own folder, and their main texture is called equi_main.exr. The other EXR files are the different maps to be combined for color-tweaking. Also includes the 12k and 8k versions. Also includes the 8k version.